Last week, Alma and Bruce Graham, of Mansfield, and Gordon Gibson, of Vernon, met with aides to U.S. Senators Joseph Lieberman, I-Conn., and U.S. Rep. Joseph Courtney, D-2nd District, to discuss several issues pertinent to agriculture and rural America as part of activities with the National Grange Legislative Fly-In. 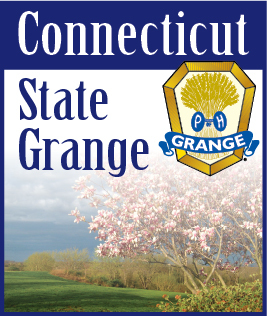 Graham serves as the Connecticut State Grange Legislative Director. Gibson serves as the Legislative Liaison to the Connecticut State Grange Board of Directors. Gibson said the Federal Insecticide, Fungicide, and Rodenticide Act would have a negative impact on the state's Agriculture Experiment Station. Gibson and the Grahams also discussed the 2012 Farm Bill, a piece of legislation threatened by Congress' intent to cut spending wherever they can. Gibson said in regard to federal farm bills, "one plan does not fit all parts of the U.S.A.. Connecticut agriculture is totally different from Midwest and Great Plains agriculture." Gibson asked legislators to consider giving state offices of the USDA the authority to adjust federal rules to fit their states in regard to the farm bill. Gibson also discussed the need to continue farm land preservation. All three also took time to share their views on the Independent Advisory Board, FIFRA, and proposed caps in interchange fees with the legislators. IPAB, the Independent Payment Advisory Board, was created under Obama's health-care reform, and would be charged with controlling Medicare spending, should Medicare costs exceed the rate of inflation plus one percent. Due to the undemocratic procedures under which the board will operate, including provisions that set its recommendations automatically into law, it is highly opposed by the National Grange. No other panel has the autonomy to be free of the American system of checks and balances. House Resolution 872, which seeks to reduce pesticide regulatory burdens by clarifying and interaction of the FIFRA and the Clean Water Act, is highly supported by the Grange and its members. Court cases arising over the last 5 years have created duplicative permitting requirements for America's growers and farmers, significantly increasing the regulatory burdens of paperwork, time, and money. HR 872 conclusively declares that no permit is required for the labeled use of any registered pesticide and Gibson, the Grahams and the National Grange remain in great support of its passage in the Senate. In addition, interchange fees would be capped as part of the Dodd-Frank Act, the Wall Street reform legislation arising from the 2008 financial collapse. The Grange stands with several groups in requesting an extended period of study for the proposal, arguing that the cap without sufficient information and review will lead to the elimination of services such as free-checking, fraud protection, online bill pay, and other free services funded by interchange fees. The National Grange, founded in 1867, is a non-profit, non-partisan organization with more than 200,000 members. Granges are located in 37 states across more than 2,200 communities and several thousand people are E-members of the nation's oldest advocacy organization for agriculture and rural America. For more information, visit www.NationalGrange.org.